Plentiful sunshine. High near 90F. Winds WNW at 5 to 10 mph..
Mostly clear. Low 63F. Winds NNE at 5 to 10 mph. A Scottsdale planning commissioner has resigned after multiple residents filed complaints alleging she violated the city’s ethics code while making comments against the need for more public outreach on development projects. 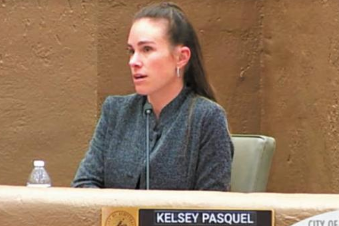 Former Commissioner Kelsey Pasquel resigned March 22, citing her decision to move into her new husband’s home in Phoenix. “I will no longer meet the residency requirement to serve on the Commission,” she wrote. Some residents believe the resignation was a way to skirt an ethics investigation stemming from comments Pasquel made at a March 13 Planning Commission meeting. Pasquel’s comments, first reported by the Progress, were seen as a violation of the city’s ethics policy by some residents, because Pasquel’s husband works for Withey Morris, a land use law firm working on the Papago Plaza project. Pasquel, then Kelsey Young, had recused herself from the vote when the project came before the Planning Commission last November. Jason Alexander, likely the individual referenced in Pasquel’s comments, filed an ethics complaint against Pasquel. Resident Albert Germek also filed a complaint, according to records provided to the Progress through a public information request. Both Alexander and Germek’s complaints allege Pasquel violated the city’s ethics code. To Alexander, Pasquel’s previous recusal is evidence that she should not have spoken publicly on any issue related to Papago Plaza. Pasquel’s comment also offended resident Andrea Alley, a community activist who lives near Papago Plaza and is also affiliated with NoDDC. She was one of the residents who voiced concern about the redevelopment to the City Council. Alley also said Pasquel’s comments discredited the work the developer did to modify the redevelopment to address some community concerns. Pasquel did not return a request for comment. Alexander compared Pasquel’s comments at the March 13 meeting – which he called “not factual” and “incredibly insensitive” – to comments made by Planning Commission Vice Chair Prescott Smith, who also stated he did not believe the city needed to revamp its public outreach process. City Attorney Bruce Washburn dismissed the complaints in light of Pasquel’s resignation. For Alexander and Alley, the situation surrounding Pasquel’s comments is systematic of a larger issue in which members of the Planning Commission are too closely aligned with the development community they are supposed to oversee. They cited numbers compiled by the Coalition of Greater Scottsdale showing the recusal rates for commissioners going back to 2016. In 2018, Smith and Commissioner Ali Fakih recused themselves more than other commissioners. Smith recused himself on 16 of the 37 votes taken by the Planning Commission at its regular meetings. Some of those votes included motions on multiple items, according to the COGS numbers. Smith said he does not believe his record of recusals affects his ability to be an effective commissioner. During that same time, Fakih recused himself on 10 of 37 votes. Smith is vice president at Technical Solutions, a public relations firm that works with developers on zoning and land use issues. “Planning Commission, as you know, serves in an advisory capacity to City Council before they make the final decision. The city has hundreds of zoning issues every year and the recusal process is in place to avoid any potential for impropriety during board/commission service,” Smith said. Referring to a problem with a “good old boys club,” Alley questioned how effective the commission can be at protecting citizen interests. “If there’s that many conflicts of interest, are they really representing the citizens or are they representing the developer and the architect and whoever else (they work with)?” she asked. Why re-do when you can RE-NEW? A federal grand jury has indicted a Scottsdale business attorney after the Internal Revenue Service alleged he masterminded a conspiracy to avoid paying $250,000 in taxes. An informal deal between Scottsdale’s Water Resources Department and a swanky northern Scottsdale golf club has caused headaches for officials after the club threatened to sue to recoup over $1 million it invested in infrastructure on the city’s behalf. A collection of aviation and military-themed memorabilia has seemingly vanished into thin air after it was removed from an old building at Scottsdale Airport to make way for construction of a new business center. On a dark, rainy early evening, a group of nearly 20 young girls – all donning rain jackets and ponchos in nearly every color of the rainbow – gathered at the trailhead of Barrier Free Nature Trail in northern Scottsdale for a nature walk.